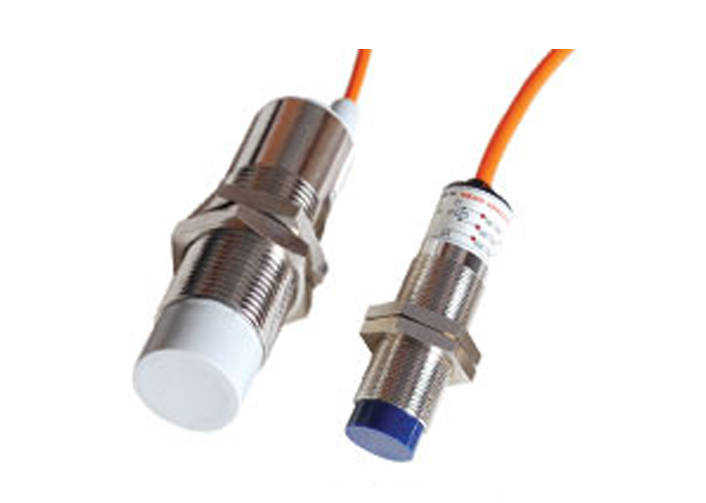 Capacitive Proximity Switches are used for the non-contact detection of any objects. In contrast to inductive switches, which only detect metallic objects, capacitive sensors can also detect non-metallic materials. Typical application are in the wood, paper, glass, plastic, food and chemical industries. Capacitive Sensors for example monitor that the contents of a cardboard box are complete or check the presence of the non-metallic caps. Another application is to monitor the conveying of sheets of glass on a roller conveyor. The capacitance between the active electrode of the sensor and the electrical earth potential is measured. An approaching object influences the electrical alternating field between these two " Capacitor Plates". This applies to metallic and non-metallic objects. In principle, capacitive sensors work with an RC oscillator. A very small change in capacitance is enough to influence the oscillation amplitude. The evaluation electronics converts this into switched signal. The user can set the sensitivity with a potentiometer.